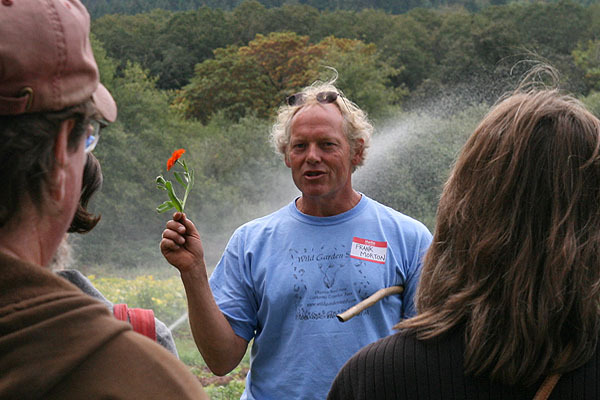 Wild Garden Seed's Frank Morton demonstrates his seed growing and selecting techniques at Gathering Together Farm in Philomath (Photo by Cheryl Brock/Slow Food Portland). 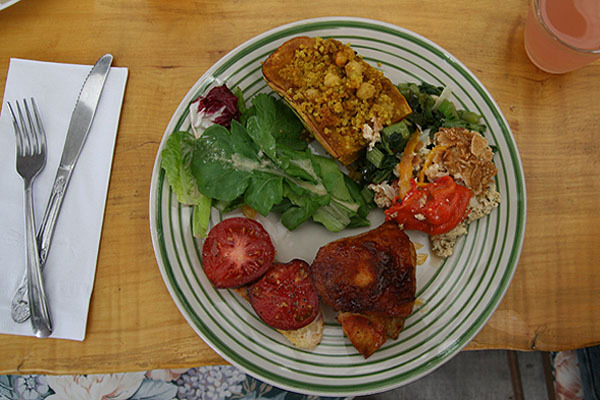 Frank Morton cultivates and harvests heirloom, organic, non-patented seeds. He is holding one of his volunteer calendula flowers here. 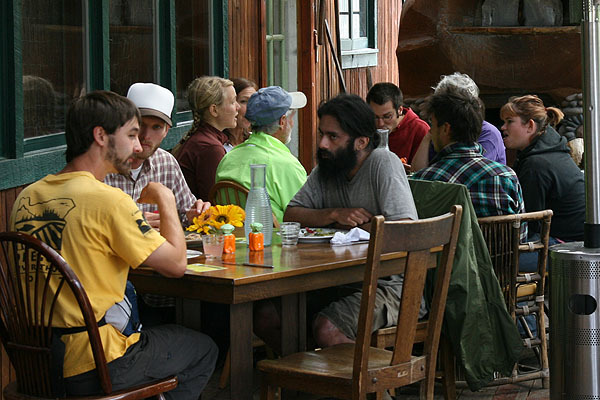 (Photo by Cheryl Brock, Slow Food Portland). 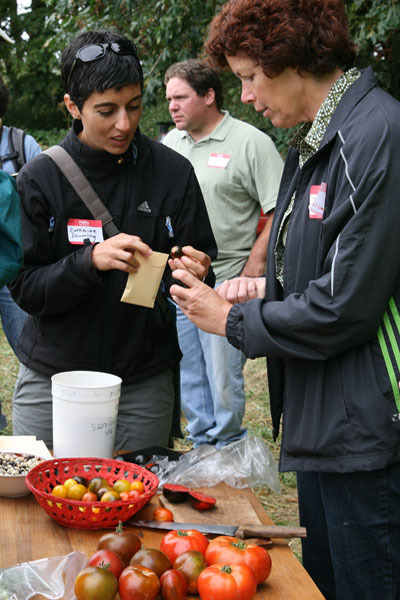 About 60 Slow Foodies and guests from chapters in Portland, Eugene, Yamhill County and Bend came out for Slow Food Corvallis’s seed education day Sept. 13 at Gathering Together Farm in Philomath. Touring Wild Garden Seed‘s fields there, participants received hands-on instruction on how to clean and save seeds and learned about seed-breeding techniques, including the controversies over patented and genetically-modified seeds. The festive yet informative event began with coffee and Gathering Together’s famous potato donuts, specially fried up that morning by owners John Eveland and Sally Brewer (even though it was their day off!). Then groups rotated between three on-farm sessions on seed selecting; seed threshing, winnowing and cleaning; and current research on naturally breeding plants for new traits (ie. 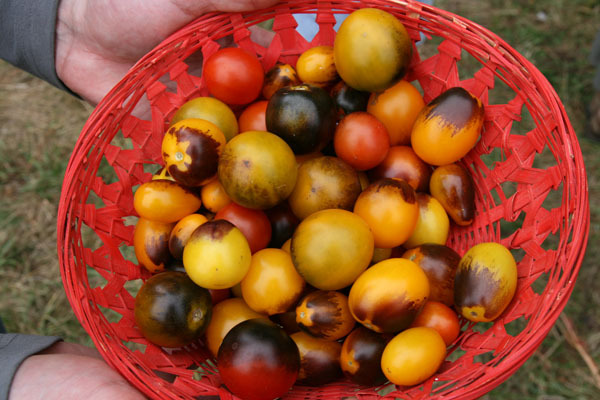 the black tomatoes Oregon State University horticulturalist Jim Myers has developed). 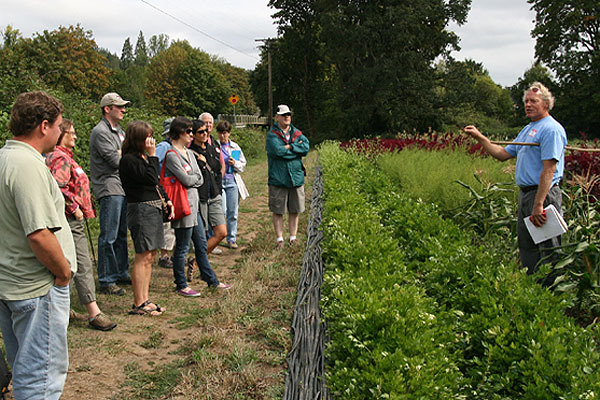 Frank Morton of Wild Garden Seed walked participants through his organic, heirloom seed production program on the farm. He demonstrated his age-old seed breeding techniques with varieties of lettuce, amaranth, quinoa, epazote and bell peppers. Morton warned against the dangers of the corporate patenting of seed traits, such as red lettuce. He demonstrated how he introduces sclerotinia fungus to his lettuce crops, to select seeds from plants that are the most hardy and naturally resistant to the fungus. Morton’s business is also one of the country’s only sources of epazote seed, which is used in Mexican cooking. 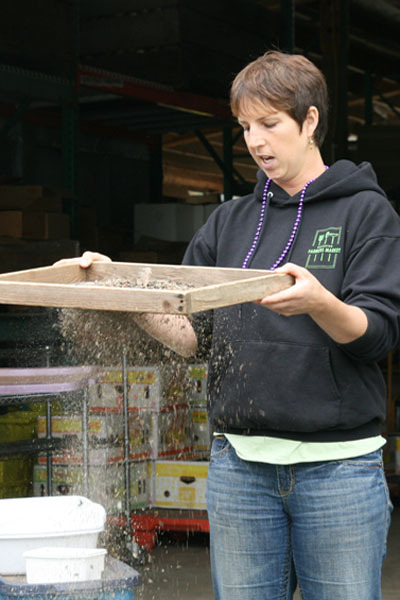 Then Laurie McKenzie of Gathering Together Farm demonstrated how to thresh, winnow and clean seeds from lettuce and fuchsia amaranth plants. Amaranth is an ancient grain that, like quinoa, Morton raises for seeds to include in his lettuce mixes. 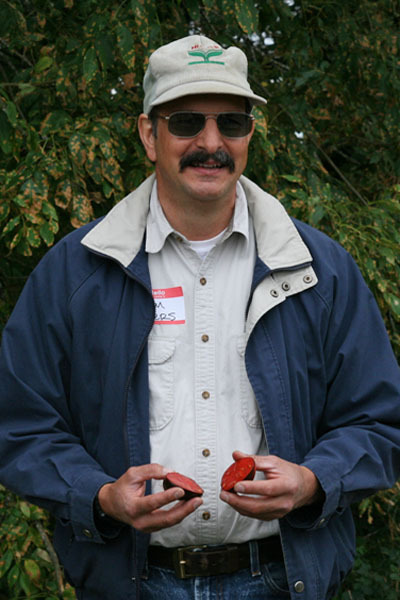 Finally, Jim Myers of Oregon State University’s horticulture department, showed off unusual black-skinned tomatoes he has bred. The anti-oxidant rich jet-black skin, due to the presence of anthocyanin (same pigment in blueberries), stood in stunning contrast to the tomatoes’ crimson red flesh. Myers hopes his black tomato varieties will soon be available for public use. He would like to receive some royalties for his discovery while keeping these tomato breeds in the public domain. But an application to patent the black trait in tomatoes is already underway with the U.S. Trademark and Patent Office. Jim Myers, of Oregon State University's horticulture eepartment, shows off the rare black tomatoes he's breeding (photo by Cheryl Brock/Slow Food Portland). Sweet and flavorful black tomatoes Jim Myers has under development (photo by Cheryl Brock/Slow Food Portland). Slow Food Regional Governor Katherine Deumling and Judi Herubin, of Slow Food Yamhill County, were among the participants at the FAFT event (photo by Cheryl Brock/Slow Food Portland).